Have you heard of the Modern Mrs. Darcy's 2016 reading challenge? While I realize it's a Wednesday, part of my Fascinating Fridays goal is to get out of my reading rut and read something, preferably more than one something, out of my normal reading comfort zone. About the time I was coming up with the idea to have Fascinating Fridays, I stumbled across the Modern Mrs. Darcy's Reading Challenge and I'm so glad I did. It's perfect! It's challenging but doable with lots of flexibility. The book categories are broad enough to encompass just about anyone's taste while maintaining a challenging aspect. 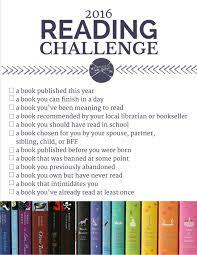 And as long as "read 12 books from 12 different categories in 12 months" means read 12 books in 12 months from 12 different categories, count me in. Care to join me? For January, I'm reading Charming by Elliott James. It falls into two of the challenge's categories - it was recommended by a friend and I already owned it. I may wait until closer to the end of 2016 to decide which category box to check off. Meanwhile, between Charming chapters, I sobered up from the Blizzard Watch to kitchner my Marigold socks. That close up may be blurry too, for all I know. I'm desperately past due on an eye exam and updated eye glasses and, horror of all horrors, the auto-focus on my camera has died. I'm having to rely on Manual mode and (a) I don't have a clue how to use Manual Mode and (b) I can't see well enough to tell if the camera is focused properly or not. But the good news is, I have two things to add to my Fascinating Friday to-do list - get new glasses & learn to use my camera. But back to reading. If you decide to join me on the challenge, let me know what you're reading. Heck, let me know what you're reading whether you join me or not. I love to talk books.